$300 rebate available only through authorized Miller distributors. Redeem rebate. 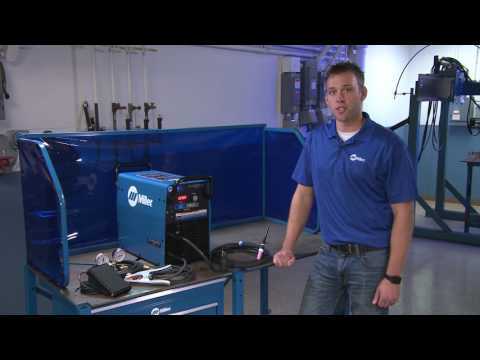 It's as easy as "1, 2, 3" to set your machine and start welding! 1. Power-up2. Select material type3. Set material thickness range We've also added a digital display so you know exactly what your settings are. Miller's Multi Voltage Plug (MVP™) allows you to connect to common 120 or 240 V power receptacles without the use of any tools. Simply chose the plug that fits the receptacle and connect it to the power cord. The package comes standard with a Diversion Series foot control and the Weldcraft A-150 TIG torch. This 150 amp, air-cooled torch features a compact and durable design ideal for both the professional and hobbyist welder. The Diamond Grip head design has ergonomic contact points for thumb and fingers, providing a more comfortable grip. Your local welding distributor can provide shielding gas, filler rod and a full product offering. Learn the tips & tricks to TIG welding for beginning and intermediate welders from metalworker Ron Covell. Miller Welders was back in full force at the 2013 Griffin King of the Hammers (held Feb. 3-8, 2013), the toughest off-road race combining rock crawling and desert racing, set in Johnson Valley, Calif. Along with partners Blue Torch Fabworks (BTF) and The Fab School, Miller Welders provided weld support, assisting drivers with repair and offering up a variety of Miller equipment and Arc Armor® welding protection free for use. Hands-on demonstrations were also available to KOH spectators in the Miller tent area, located off Miller Welders Way. Miller Welders was excited to sponsor the recent 2012 Griffin King of the Hammers, the toughest off-road race combining rock crawling and desert racing, set against the desert landscape of Johnson Valley, Calif. Partner and off-road manufacturer Blue Torch Fabworks joined Miller on-site to offer free equipment access, weld support and specialized off-road repair to the race participants and their 242 vehicles on the lake bed. Over the course of the event, Miller Welders completed more than 170 race repair applications — both assisting drivers with welding support and offering up a variety of Miller welding and cutting equipment and Arc Armor welding protection free for their use. Greg Anderson, four-time NHA Pro Stock world champion, relies on the versatile Diversion® 180 TIG welder to stay in the race. Steve demonstrates how to build a coffee table using a Millermatic 211 Auto-Set MIG welder and Diversion 180 TIG welder. Josh Welton of Brown Dog Welding takes you through the process of proper weld repair on everyday items. Cotati Speed Shop highlights the Diversion™ advantage. Miller Diversion™ Series TIG welders are lightweight, portable and easy to use.